The Liberal Party headed by the late Ninoy Aquino blames the late president Ferdinand E. Marcos for Martial Law abuses including acts of terror during Martial Law like the Plaza Miranda bombing. Marcos slammed the accusers by throwing back the blame. That led to the stepping down of the strongman during the people’s power revolution in EDSA. Now, many players of those terror activities prove that Marcos is right. It was Aquino in collaboration with Joma Sison that masterminded the fatal events. Therefore, the CPP-NPA-NDF rebels are already terrorists ever since. 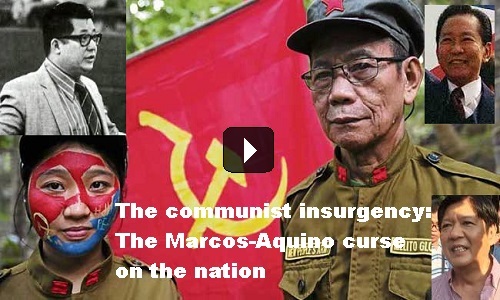 [VIDEO]: Ninoy networked with the Communist Party. A weak sense of nationalism is evident through the country’s reputation as the biggest migrant nation in the region. There is an exploitative Spanish- and Chinese-descended elite mindset. Many would rather not be known as Filipinos.The country a fragile state that is easily manipulated by the oligarchy. Our great awe of foreign capital allows foreigners to dominate telecoms and other public utilities even if the Constitution prohibits so. We have the longest standing communist insurgency in the whole world. The Communist Party of the Philippines celebrated its 48th anniversary last December. Other Southeast Asian nations are not immune to communist insurgencies. China under Mao Zedong tried to foment Marxist revolution in the region to be able to construct a wall of communist client states around it to keep out the US dominion. However, those countries have crushed these insurgencies more than two decades ago—excluding the Philippines. US imperialism in the Philippines and big landlords may still exist but are somewhat defeated. The evidence is the kicking out of all US military bases in the country and the passing of land reform laws by the late president Marcos. The Liberal Party highly criticize these achievements of the strongman until now. It is now understandable why politicians under the Liberal Party like the Vice President Leni Robredo always shout to accuse the government of human rights violations when it comes to extra-judicial killings that allegedly results from the President’s war on illegal drugs. This is to give an image to the government that it is so demonic to get public sympathy. Once many people are brainwashed, they can already stage another people’s power revolution. Previous post: What does Bongbong Marcos think of Former Vice President Jejomar Binay?